Public speaking coaches suggest you size up your audience before you deliver a speech. I’m told there are three ways to segment an audience; those who already embrace what I have to say; those who stand in the middle and need further convincing and those who oppose or disagree with what I have to say. I’m told those who oppose or disagree will not move all the way to embracing my thoughts, that the best I can expect is for them to move towards the middle and those in the middle move towards what I am going to suggest here tonight. Now I have a problem because my assessment of this audience is either that they embrace alternative medicine and some of its obvious misdirection, or they embrace conventional medicine and all of its deadly trappings, or that they embrace parts of both which is practically where most people stand. The problem is, what if both are on the wrong track? Just how am I going to address such an audience? In the next few minutes I am going to tell you that cancer has been cured and how you can do that without any hand holding, both with and without the use of conventional medicines. That should surely be the way to win over a bipolar audience such as this. But sadly, it won’t. I am going to tell you that we have met the outer limits of what can be accomplished to prevent and cure cancer because in satisfying your proclivity towards conventional or alternative medicine I am still butting up against the greatest tool modern medicine uses in its deadly quest to control your mind and your healthcare decisions — FEAR. Gripped with the fear of the fresh diagnosis of cancer what will you elect to do? I can tell you right now but I will save it for the end. I just may demolish your closely held beliefs in alternative therapies – namely that alkaline diets cure cancer. Here are the lines of evidence that alkalinity does not prevent or cure cancer. The acid/alkaline balance of the blood is automatically controlled to remain within neutral pH (~7.4)3 and if alkaline or acid diets could significantly alter blood pH we would continually be in the emergency room being treated for alkalosis or acidosis. Furthermore, I ask those who believe alkaline diets prevent cancer if they believe probiotic “friendly bacteria” such as acidophilus should be supplemented in the diet? Most respond positively. Yet acidophilus (its first four letters spelled out are A-C-I-D) is acid-forming bacteria. Now, are you ready to hiss and throw me out of this conclave before I go any farther? It’s outrageous to believe I know what the cure for cancer is, after all, where is my Mayo Clinic diploma? I really have a lot of convincing to do get you to believe that in the next few minutes. In the 1930s it was Otto Warburg who won two Nobel Prizes for his discovery that cancer cells convert from using oxygen to sugar for energy.4 There is always some “sugar burning” going on, but cancer cells generate up to 60% of their energy from sugar rather than ~5% in healthy cells. By the way, because cancer cells utilize sugar for energy they expel lactic acid, and that is how the alkaline theory of cancer got started in the wrong direction. The acid is expelled outside of the cancer cell. Indeed, the very way cancer is detected in this modern era is to image tumors using PET scan technology where radioactive sugar is instilled and the sugar is immediately attracted to feed the fast-growing ball of cancer cells wherever they may be, and then visualized on the PET scan.5 The cancer industry certainly knows sugar feeds cancer. But for inexplicable reasons, limitation of dietary sugar is not in the average oncologist’s armamentarium. From an experiment conducted in 1909 that demonstrated the growth of implanted tumors was inhibited by underfeeding mice, to reduction in the recurrence of tumors from 82% in fully-fed mice to only 28% in underfed mice in an experiment conducted in 1926, it has been widely known that diet can control cancer. Another experiment showed that a limited calorie diet combined with high-fat intake reduced tumor incidence from 73% to just 7%. A report in the journal The Oncologist suggests that dietary restriction or intermittent fasting “may be a potent supportive intervention for patients undergoing standard cancer treatment.”11 But is there a cancer patient that ever hears of this? The original ketogenic diet was designed by Dr. Russell Wilder in 1924 to treat epilepsy. It is a diet high in fat, adequate in protein and low in carbohydrates. There already is a ketogenic medical food called KETO-CAL14, a nutritional food that is 1.6% carbohydrate and 90% fat used to treat childhood epilepsy that has been shown to reduce brain tumors in animals by 35-65%. Good God, we already have a nutritional-based cure for cancer. All three dietary approaches, calorie restriction (fasting) or a low carbohydrate diet or a ketogenic diet, reduce blood glucose levels that tumor cells depend upon for survival. The use of a low-carbohydrate (no bread, no rice, no pasta), or calorie-restricted and/or ketogenic diet (low calories, high fat) decreases the growth of cancer by 15-30% in animals. The remaining growth depends on glucose formed by the liver. It is instructive to learn that in the animal lab 50% of mice fed a carbohydrate-rich western diet exhibit tumors by age 1 whereas no tumors are detected in mice fed a low carbohydrate diet. So let’s go to our doctor and demand we get an Rx for metformin. But wait. We know modern medicine has dragged its feet for over a century on the connection between diet and cancer and for over 80 years since the discovery by Otto Warburg in Germany that cancer cells thrive on sugar; and since 1971 when it was first realized metformin reduces cancer growth and mortality. Why are we going back and asking our doctors for metformin when they have lost all level of trust? But what if we, for many reasons, don’t want a synthetic drug to treat our cancer? There is a natural molecule for you. And it turns out that resveratrol, known as a red wine molecule, has been found to increase AMPK 200 times better than metformin. Modern medicine is ignoring resveratrol, but you don’t have to. 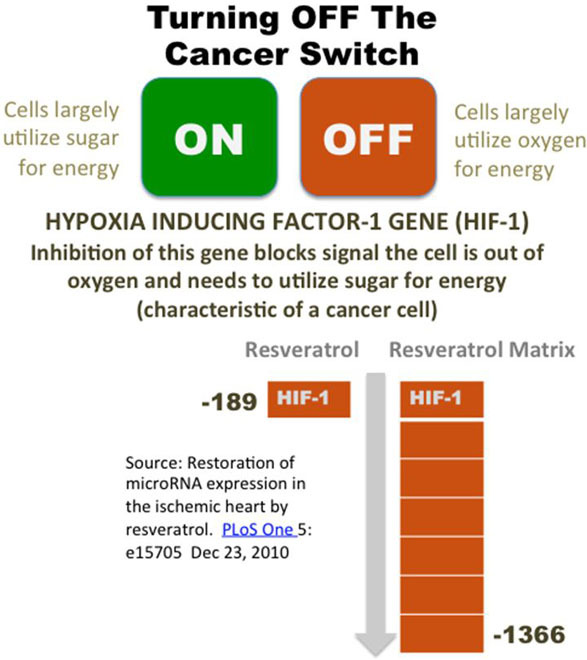 Resveratrol also turns off the cancer switch. But what would happen if we blocked that cell signal? What if we shut off the HIF-1 protein from being produced? Cells might actually be oxygen deprived, but if the HIF-1 signal is not sent, cells would not convert to utilization of sugar for energy. Also HIF-1 inhibition blocks the development of new blood vessels that facilitate the delivery of sugars and other nutrients to the tumor site. The most profound HIF-1 inhibitor, pharmaceutical or nutriceutical, is a matrix of natural molecules called polyphenols available as a propriety dietary supplement, a proprietary formula I confess I have a financial interest in. In research conducted by National Institutes of Health researchers report this nutraceutical was found to down-regulate genes that control HIF-1 by -1366-fold in rodent heart tissues. This was compared to plain resveratrol -189 fold.30 The cancer switch can be demonstrably turned off by an off-the-shelf molecule – resveratrol and more so when combined with other similar molecules. The scientific literature points to combination therapy, low sugar and low carbohydrate diets combined with drugs and/or nutraceuticals to successfully subdue cancer. Will anything ever change in cancer therapy? Seventy-percent of cancers are solid tumors which radiation or chemotherapy cannot penetrate.33 Chemotherapy inevitably results in cancer treatment resistance and destroys the immune system. Modern cancer treatment is largely an exercise in futility. Infusion of chemotherapy agents in the oncologist’s office, which by one report only contribute to ~2% of the cancer cures34, generates 80% of an oncologist’s income.35 Any therapy that would interrupt that income stream would likely be ignored or rejected outright. Nothing may ever be allowed to change in the cancer treatment arena. But that doesn’t mean you need to be a victim of cancer and/or be duped by the cancer treatment industry. Will anything that I said tonight change the way you practically address your diet or alter your health decisions? That is not likely. Do you think that you would stand a good chance of living more than 9 months longer by adhering to what you have learned here tonight? Do you think that a low sugar/carbohydrate diet combined with a drug like metformin or a molecule like resveratrol would prolong life by 9 months without all the pain, suffering, anguish and financial ruin that results from modern cancer treatment? So what are you going to tell others about what you heard tonight? You may tell others you heard some homeopathic lecturer talk about sugar and cancer at a dinner party and you decided to forgo dessert. You are stymied. You don’t know what to do with the information that has just been delivered to you. You, you want to check with your doctor first. You need to hear this from others before you believe it. Why doesn’t my doctor tell me this, you ask? Yes, why doesn’t he? You see, you have never made an independent health decision in your lifetime and now you are being asked to do that in regard to a mortal disease. You are paralyzed by the thought of making the wrong decision. If your mother has cancer and you attempt to share this information with her to forgo chemotherapy, your relatives will secret her away for a second opinion with an oncologist and you won’t be able to stand up to them. They have the doctors and all that medical technology on their side and all you have is a few herbs and a diet in their place. So where does this information leave you? In summary, if you prefer conventional medicine and you or a loved one are diagnosed with cancer or desire to prevent recurrence of cancer you might consult with a licensed physician about a prescription for the anti-diabetic medicine metformin. If you adamantly have camped yourself away from using any conventional cancer treatment and are looking for a natural remedy, you might start with resveratrol in modest doses (no more than 350 milligrams/day). If you already take metformin, you can take resveratrol with it to potentiate its action. If you absolutely don’t want anything to do with pills, you can start with a low-sugar/ low-carbohydrate diet. So where did I just leave my audience – perplexed, paralyzed, frightened, pulled in two directions, pitted against family members and doctors, feeling they face the rest of life without ever having a chocolate chip cookie again, feeling exploited by the cancer treatment industry, and needing validation from other sources? Shall we muscle test the ideas presented here? You will have to sort it out from here on your own. I often ask myself why I beat myself up attempting to reach out to people who have no ears to hear? My message of hope is trumped by white coated-doctors with Mayo Clinic diplomas. But how can they say it is unproven, especially when chemotherapy and radiation treatment have been disproven?39 And with that said, why don’t we take care of all the tension I have just created and have an extra dessert? © 2015 Bill Sardi, Knowledge of Health, Inc.
Duan L, et al, Antacid drug use and risk of esophageal and gastric adenocarcinoma in Los Angeles County. Cancer Epidemiology Biomarkers 18: 526-33, Feb 2009. Yeh YC, et al, H pylori CagL-Y58/E59 prime higher integrin A 5B1 in adverse pH condition to enhance hypochlorhydria vicious cycle for gastric carcinogenesis. PLoS One 8: e72735, Aug 29, 2013. Overview of acid-base balance. The Merck Manual (April 2013). Chen X, et al, The Warburg Effect: evolving interpretations of an established concept. Free Radical Biology Medicine Sept 29, 2014. Razungles J, et al, The Warburg effect: from theory to therapeutic applications in cancer. Medicine Sciences 29: 1026-33, Nov 2013. Garber K, Energy boost: the Warburg effect returns in a new theory of cancer. Journal National Cancer Institute 96: 1805-06, 2004. Madrimas, Excess sugar linked to cancer. Science Daily Feb 1, 2013. Dowman JK, Development of hepatocellular carcinoma in a murine model of non-alcoholic steatohepatitis induced by use of a high-fat/fructose diet and sedentary lifestyle. American Journal Pathology 184; 1550-61, May 2014. Kritchevsky D, Caloric Restriction and Experimental Carcinogenesis. Toxicological Sciences 52: 13-16, 1999. Champ CE, et al, Nutrient restriction and radiation therapy for cancer treatment: when less is more. The Oncologist 18: 97-103, 2013. Lee C, Longo VD, Fasting vs dietary restriction in cellular protection and cancer treatment: form model organisms to patients. Oncogene 30: 3305-16, July 2011. Magee BA, et al, The inhibition of malignant cell growth by ketone bodies. Australian Journal Experimental Medical Science 57: 529-38, Oct 1979. Jacob P, Chowdbury TA, Management of diabetes in patients with cancer. Quarterly Journal Medicine Oct 31, 2014. Gy J, et al, Incidences of diabetes and prediabetes among female adult breast cancer patients after systemic treatment. Medical Oncology 30: 687, 2013. Seely S, Horrobin DF, Diet and breast cancer: the possible connection with sugar consumption. Medical Hypotheses 11:319-27, July 1983. Quinn BJ, et al, Repositioning metformin for cancer prevention and treatment. Trends Endocrinology Metabolism 24: 469-80, Sept 2013. Oleksyszyn J, The complete control of glucose level utilizing the composition of ketogenic diet with the gluconeogenesis inhibition, the anti-diabetic drug metformin, as a potential anti-cancer therapy. Medical Hypotheses 77: 171-73, 2011. Lega IC, et al, The effect of metformin on mortality following cancer among patients with diabetes. Cancer Epidemiology Biomarkers Prevention 23: 1974-84, Oct 2014. Anisimov VN, Do metformin a real anticarcinogen? A critical reappraisal of experimental data. Annals Translational Medicine 2: 60, June 2014. Chen S, et al, Combined cancer therapy with non-conventional drugs: all roads lead to AMPK. Mini Review Medicinal Chemistry 14: 642-54, 2014. Begul PK, et al, Attenuation of insulin resistance, metabolic syndrome and hepatic oxidative stress by resveratrol in fructose-fed rats. Pharmacological Research 66: 260-68, Sept 2012. Zwaans BM, Lombard DB, Interplay between sirtuins, MYC and hypoxia-inducible factor in cancer-associated metabolic reprogramming. Disease Models & Mechanisms 7: 1023-32, 2014. Purkayastha BP, Roy JK, Cancer cell metabolism and developmental homeodomain/POU domain transcription factors: a connecting link. Cancer Letters June 5, 2014. Yang F, et al, Reciprocal regulation of HIF-1a and lincRNA-p21 modulates the Warburg effect. Molecular Cell 53: 88-100, Jan 2014. Prigione A, et al, HIF1a modulates cell fate reprogramming through early glycolytic shift and upregulation of PDK1-3 and PKM2. Stem Cells 32: 364-76, Feb 2014. Palsson-McDermott EM, O’Neill LA, The Warburg effect then and now: from cancer to inflammatory diseases. Bioessays 35: 965-73, Nov 2013. Semenza GL, HIF-1 mediates metabolic responses to intratumoral hypoxia and oncogenic mutations. Journal Clinical Investigation 123: 3664-71, Sept 2013. Mukhopadhyay P, et al, Restoration of altered microRNA expression in the ischemic heart with resveratrol. PLoS One 5: e15705, Dec 23, 2010. Kim JJ, Tannock IF, Repopulation of cancer cells during therapy: an important cause of treatment failure. Nature Reviews Cancer 5: 516-25, July 20005. Tannock IF, et al, Limited penetration of anticancer drugs through tumor tissue. Clinical Cancer Research 8: 878, March 2002. Morgan G, et al, The contribution of cytotoxic chemotherapy to 5-year survival in adult malignancies. Clinical Oncology 16: 549-60, Dec 2004. Medical Oncology Compensation Survey Report 2013. Integrated Health Strategies, 2013. Huchcroft SA, Snodgrass T, Cancer patients who refuse treatment. Cancer Causes & Control 4: 179-85, May 1993. Santisteban GA, et al, Glycemic modulation of tumor tolerance in a mouse model of breast cancer. Biochemical & Biophysical Research Communications 132: 3: 1174-79. Morgan G, et al, The contribution of cytotoxic chemotherapy to 5-year survival in adult malignancies. Clinical Oncology (Royal College Radiology) 16: 549-60, Dec 2004.